The European Commission expects German growth to be only 1.1% in 2019 due to weakening export growth and growing consumer restraint. Destatis – the German statistical office said last month that the country grew at a rate of 1.5% in 2018, compared to 2.2% in 2017, this was the weakest growth rate since 2013. German industrial production declined 0.4% in December, the fourth consecutive monthly fall. The European Commission also slashed its economic growth forecast for Italy for 2019 to just 0.2% due to uncertainty over government policies and higher borrowing costs. Italy is already in a technical recession. The Bank of England expects GDP growth in the United Kingdom in 2019 to be 1.2%, it had previously (in November 2018) forecast growth of 1.7%. The 2019 forecast is the lowest GDP is the slowest since 2009 when the UK entered a recession. The Bank of England blames mounting Brexit uncertainty and a global slowdown for lower economic growth. 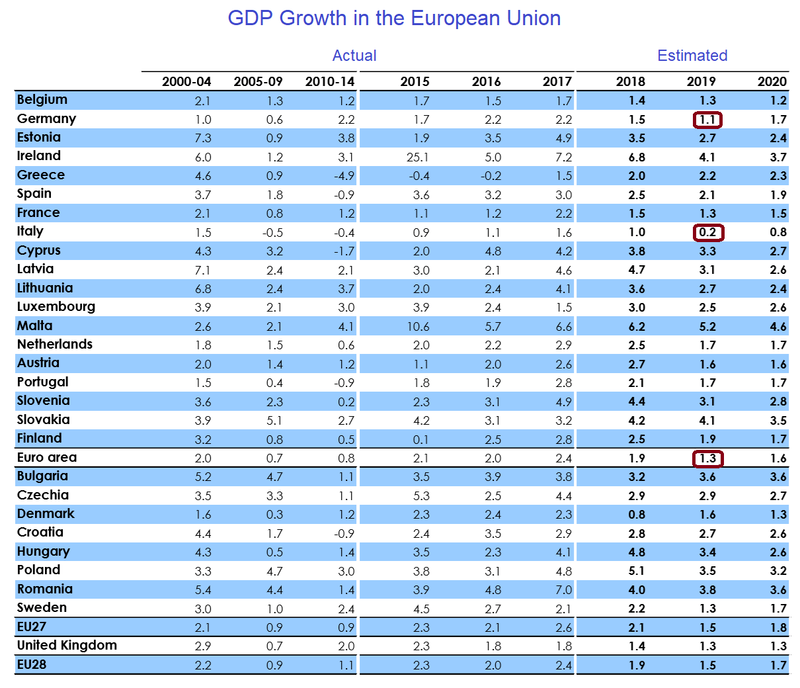 Both the Bank of England and the European Commission forecast GDP growth for the United Kingdom in 2019 to be more than that of Germany, despite Brexit. Previous PostPrevious Is Household Debt in the U.S. really a bigger problem than before the financial crisis?